@DailyNewsVinny For 3 new stadiums (LA, SD, LV) nearly $1B in credits is being counted on. Where is $$ coming from w/ credits exhausted? About 7% of financial advisors in US have a black mark on their record. About 24% of NFLPA Registered Financial Advisors have a black mark. — Sheilla Dingus (@SheillaDingus) November 18, 2016. Here’s the first article of a three-part series that addresses some difficult questions about domestic violence in the sporting world and beyond. Part I is addresses the mishandling of domestic violence cases, setting the stage for the following installments to address the challenges faced in prosecuting crimes against women and hopefully some constructive suggestions for moving in a positive direction on this vital issue. Beginning at about 19:30 of this Night Moves podcast Daniel Wallach evaluates the ongoing investigation into Cowboys running back Ezekiel Elliott’s domestic violence allegations. Derrick Rose will be a free agent this summer. An appellate reversal and new trial could depress demand for his services and contract value. For additional info and evaluation of the appeal, I highly recommend reading @WALLACHLEGAL twitter feed. Yesterday Ed O’Bannon interviewed with Michael McCann at the University of New Hampshire for the first time since his historic case. Here’s one of my favorite quotes from the interview. For more from O’Bannon, I recommend checking the Twitter timelines of @McCannSportsLaw and @WarrenKZola. Sports Illustrated’s “Football in America” deep dive has resulted in the longest and most comprehensive SI piece ever. In it they speak to fans around the country about NFL issues…Then SI speaks with Roger Goodell. Spoiler…He disagrees with much of what fans have to say. DraftKings/FanDuel Actually Merging This Time? By my count, there are 19 changes to the new NBA CBA that have leaked. To date, 3 of 11 NBA teams (Memphis Grizzlies, Milwaukee Bucks, and Dallas Mavericks) have stopped staying at Trump hotels. Will Last Sunday’s Super-Match-ups end the NFL’s Ratings Woes? What’s going on with these ivy league schools?? News: Ex-Northwestern PG Jonnie Vasser files antitrust lawsuit against school, NCAA challenging transfer rules. Is the ratings rebound due to the end of the election, or could it be two quality games available on Sunday? Excellent discussion in this episode; the dynamic Dans delve deeply into the Ezekiel Elliott investigation as well as domestic violence in the NFL as a whole. Also their take on how a Trump presidency might affect a number of issues in the sports world. CSU basketball player Gian Clavell arrested https://t.co/HYbpcUd7Ns via @coloradoan Another DV arrest…. Take a minute to sign and share. While it may not be the catalyst that removes Goodell from the commissioner’s throne, the more people are reminded of his >> the more likely they are to watch and spend less, which will eventually cause the owners to rethink the commissioner position. Per Daniel Wallach via Twitter, policies governing Ezekiel Elliot investigation are the NFL Personal Conduct Policy and Article 46 of the CBA. For a first offense, a player should be subject to a 6 game suspension. A repeat offense “will” result in permanent banishment. Since those close to Elliott say he’s being viewed as “Public Enemy # 1,” it will be interesting to see how the NFL proceeds, in light of so many bungled domestic violence responses. Will Elliott, as a star RB be made an example of, will politics win out? Or will they actually follow their own rules and do a responsible investigation and act accordingly? Former player Darryl Ashmore’s disability lawsuit; I wrote about it here. The NFL response is due 11/21. Redskins cornerback Josh Norman was fined $25K this month for declaring that field judge Brad Freeman serves same purpose as vacuum cleaner. This, by the way, is the same amount as the prescribed fine for an equipment violation. It’s also the first time a player has been disciplined for criticizing an official. More NFL consistency…..Meanwhile, Kelce gets removed from a game and fined $24,000 for “flagging” an official. In regard to Walt Anderson – the NFL went against his best recollection as to what gauge he used during Deflategate. Did they think that perhaps he’d suffered one too many concussions and was lapsing into dementia? Probably not. Just needed a particular outcome and Anderson’s best recollection wasn’t producing that outcome. Now Seahawks Richard Sherman has been fined as a result of Anderson’s officiating error. I really hope we don’t see Anderson on the field for the Patriots/Seahawks game. Hard to predict what will happen if he officiates that one. Food for thought…What was Richard Sherman supposed to do? Stop the play before the whistle was blown? Fine the official? Good luck! Sources: #Saints safety Kenny Vaccaro is facing a 4-game suspension for violating NFL drug policy for use of Adderall. Unlike the Personal Conduct Policy, the NFL & PA negotiated the drug policy. Per Jim Baumbach of Newsday Sports, who attendeded Jeurys Familia’s court hearing yesterday, Familia pled not guilty; court ruled that media can’t report victim’s name/image; case will proceed with or without victim’s sanction. Judge removes “no contact” condition at the request of both parties. Discovery is completed. Familia attorney wants to move ahead with case. Judge says next hearing is Dec. 15. The NHL has implemented a new concussion policy and has received criticism for implementing it in this case, whereas the NFL has received much criticism for doing the opposite. 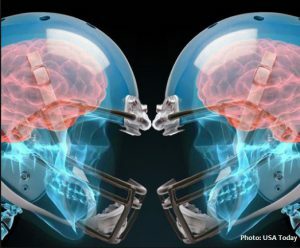 No easy answers with concussions, but in my opinion, best to err on the side of player safety there are many games to be played but a player has but one brain.